If driving to the hospital by car, follow signs for Oxford then the 'H' / 'A&E' and 'Hospitals' signs. You'll be directed via the A40 northern by-pass to Headington on the A420 London Road. Turn left at the traffic lights (crossroads) leading to the B4495 (Windmill Road). The hospital is about 750 metres on the right. From the Woodstock Road, travel north for one mile, then right (Moreton Road) following the 'H' and 'A&E' and 'John Radcliffe' signs, along Marston Ferry Road to Headley Way. Go past the entrance to the John Radcliffe hospital to the traffic lights at the top of Headley Way. Turn left on to the A420 London Road. Turn right at the traffic lights (crossroads) leading to the B4495 (Windmill Road). The hospital is about 750 metres on the right. 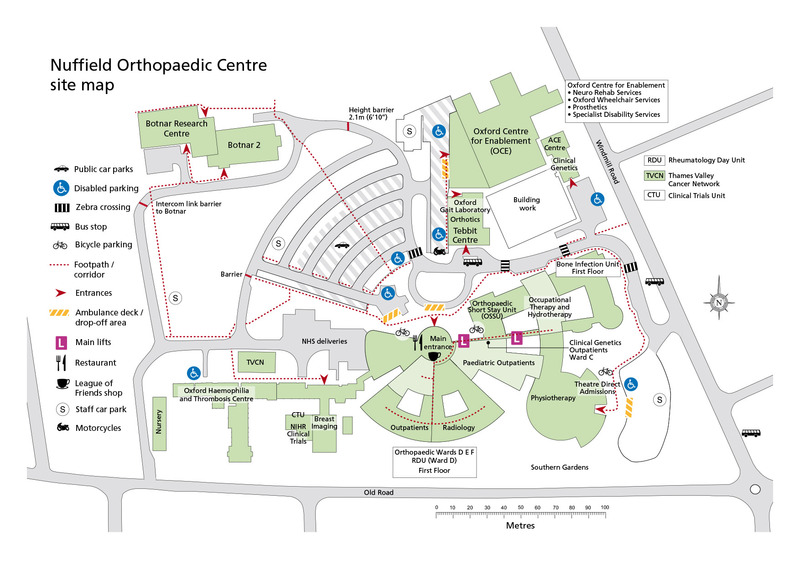 Nuffield Orthopaedic Centre on Google maps (please note the main entrance is on Windmill Road). There is free motorcycle parking to the left of the Tebbit Centre, in front of the Oxford Gait Laboratory. Parking for orange or blue badge holders is free of charge. Disabled parking and areas for setting down and collecting patients are available close to entrances. Parking enforcements operate across the hospital site. Please park in marked bays and display relevant pay and display ticket. There is a £40 penalty for inappropriate parking (£80 if not paid within 14 days).